The Lucky Lady Hotel and Casino resort is so very creatively great! You have designed it so very well! Each of the levels and areas in the Resort, both indoors and outside look great! 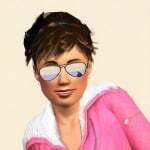 There are so many enjoyable and fun activities for sims to do at the Resort! It was very nice how you creatively wrote the descriptions of each of the levels and features of each level. The four level waterfall looks very great! The pool looks very nice in the shape of a whale! The colours and patterns of the interior walls and floors look very vibrantly nice! It is a very special and very detailed Resort! Thank you @rosemow ! Many, many hours went into this one. Many discarded designs too. Lady Luck hotel looks wonderful, that 4 story waterfall makes a fantastic center piece, I love your choice to use windows and a wrap around balcony the whole way down to show it off from the street view too. I can tell that you put a lot of thought into the build and included fun for the whole family, with the playroom for tots, and a arcade for teens. Live here and every day is a vacation! We have a rare opening on the top floor of our exclusing building. Two bedrooms, two bathrooms, living room, and eat-in kitchen. All residents have access to workout room, game room, rooftop patio and garden. All appliances upgraded. Wow! You have been a busy girl! Beachview Condos looks great! And those views from the rooftop would be fantastic! Got ya Rec'd! Well done! 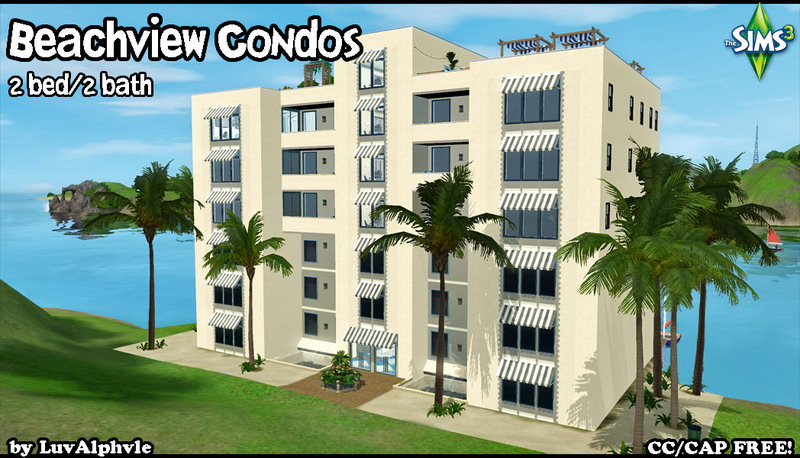 Beachview condos is a very nice apartments build! Very nice exterior design of the building, and the placement of the windows and awnings over the top of them looks very nice. The rooftop garden and patio is very nice! The flowers look very pretty! Sims will enjoy relaxing on the loungers there under the pergola shades looking out at the very nice view! The outdoors dining area is very nice for sims to enjoy cooking on the bbq and eating meals at the tables in the sunshine. Very nice layout and furnishing of the interior of the build! The lobby area is very nice! The sculpture feature looks very great! The floor patterning is very nice. 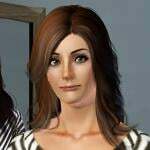 Sims will enjoy chatting whilst sitting on the sofas. It is great that there are shared gym and games areas where sims can enjoy using the gym equipment to keep fit and fun playing arcade machine and table games in the games room. Very nice blue and white colour scheme of the apartment . The furnishing of the two bedrooms looks very nice. Very nice light filled kitchen and dining room! Sims will enjoy the sunshine coming in onto them as they are eating their meals at the dining table. The fruit bowl, hanging pans and knife set are nice home touches. It is a very nice condos build! Very nice apartment, I love the nautical themed decor and the plum colors used throughout the common areas. The firepit on the dock, looks like a perfect spot to stargaze over the water. The rooftop garden and dining area is a nice touch, I'm sure there are great views from there. If you like sky-high living, the Contempo Towers are for you! The building is currently set up as a one-bedroom, one-bathroom player unit and five NPC units, but if you want to move the lot markers around you can move into the three-bedroom, two-bathroom unit. Shared building amenities include laundry room, workout room, and empty hobby room for you to put items in for your Sims to enjoy! Parking for plenty of vehicles in the back. All appliances upgraded. 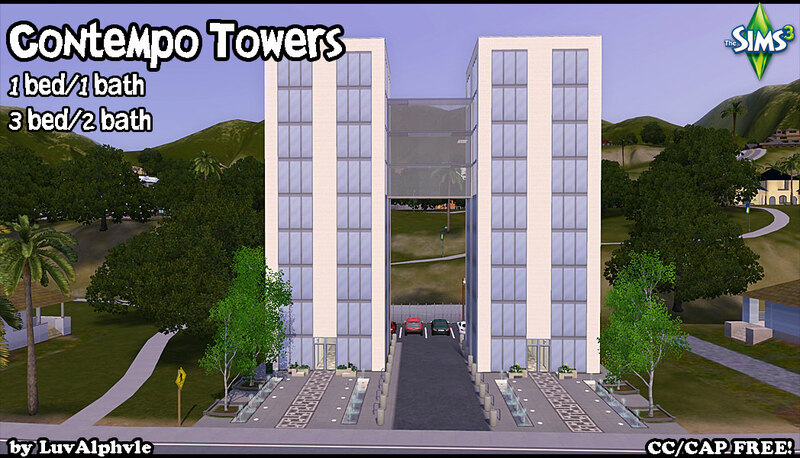 The modern design and layout of Contemporary Towers looks great! 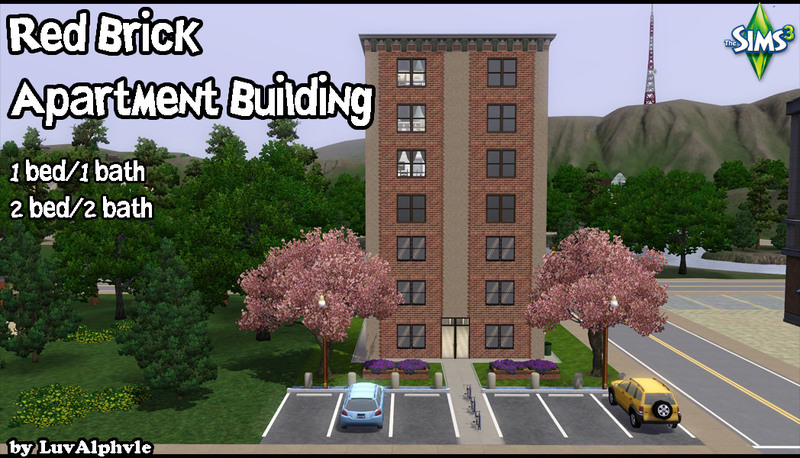 It is a very nice high rise units build! Sims will have very nice views through the windows when living in the units. Very nice layout and furnishing of both the one bedroom and three bedrooms units. The lime and white colour schemes of the units looks very nice. It is great that there is a shared laundry room to do washing and drying of clothes, as well as a gym for sims to use the gym equipment to keep fit. The white brick wall texture through the build suits the modern style of the build. The glass walled passageway between the two towers looks great! It is a very nice high rise living units build! Very nice apartment, I love the clean lines and bold pops of color. The skywalk is such a great idea. Thank you @ciane and @Jessabeans ! Come enjoy affordable city living! For under §8,500 you can move into our cozy one-bedroom, one-bathroom unit. You won't find a deal like this anywhere else in the city! If you should outgrow your unit, you don't even have to leave the building - simply move up! For a bit more Simoleons you can expand your family into the two-story, two-bedroom, two-bathroom unit a couple floors above. Building tenants enjoy free parking, a communal workout room, laundry room, and empty hobby room for you to place items you may not have room for in your apartment. All appliances upgraded. The lot includes two custom wallpapers by me. Otherwise it's CC-free. The design and layout of the apartment build is great! Thank @rosemow ! I had to mess around forever to figure out how to make the matching wallpaper. It's been a while since I uploaded anything! So I put together a base game house. This house is Acadian-style, which usually means one floor and a high-pitched roof. There are four bedrooms and two bathrooms. All appliances have been upgraded. The house is furnished for four Sims plus one infant/toddler. There is also am unfurnished basement, or the beginnings of one, for you to remodel as you like. I used ONLY base game items no matter what the Exchange says. 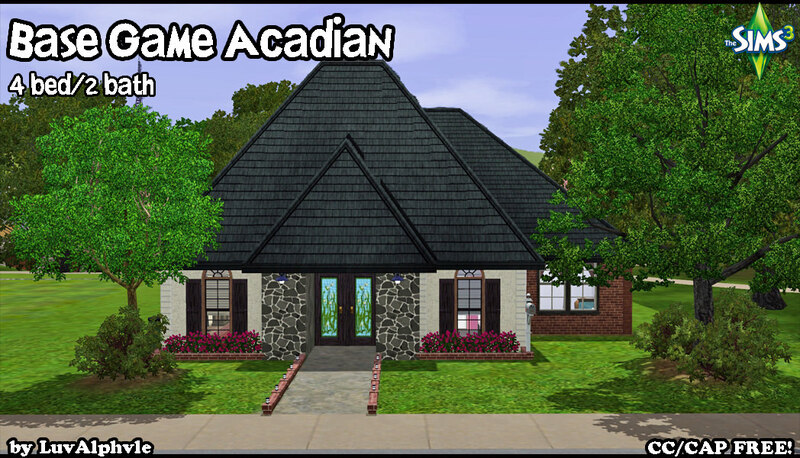 Base Game Acadian is a very nice home! The high pitched roofing looks great! The open shutter flower bed windows in the front area of the home looks very nice. It is great that it only uses base game items! Very nice backyard play area for kids to have fun playing on the playground equipment and the family will enjoy cooking meals on the bbq to eat at the picnic table in the outdoors air. Very nice layout of the interior of the home. It is great that there is a basement level. The open plan living, dining and kitchen areas looks very nice. Nice sofa and armchair sitting area for the Sims to enjoy resting there watching tv or reading a book. The bookcases look great placed either sides of the tv. The wall patterning in the kitchen adds a nice look to the area. 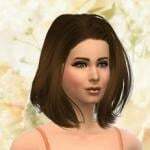 The sunflowers wall picture in the master bedroom is nice and sunny for sims to see when getting up in the mornings. Very nice colour schemes and wall patterns in the kids bedrooms! The bedrooms look very nice! It's been a while since I uploaded! 4 bedrooms, 3.5 bathrooms. Enjoy this split-level shed house with a formal living room, eat-in kitchen, office, basement family room, and large backyard space. All appliances upgraded. I am in awe at how talented you are! You have a serious gift at exterior and interior designing. EA should hire you to design their buildings. 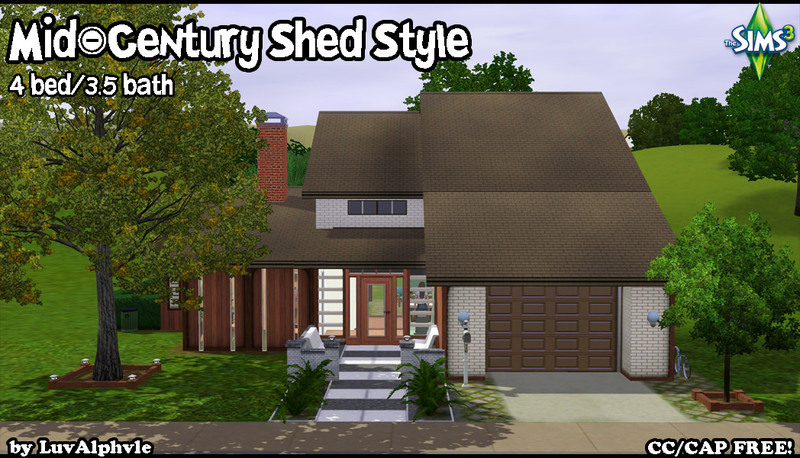 The exterior design of Mid Century Shed Style is very nice! The design of the roofing, and the wooden texture of the walls looks very nice. The plants look nice on the edges of the front path.Very nice backyard area for Sims to enjoy cooking on the bbq and eating food outdoors in the air. Kids will have fun on the swings and playing in the treehouse . Sims will enjoy sitting around the firepit keeping warm and toasting food,.Very nice layout and furnishing of the interior! The pictures are nice touches on the walls in the living room. Very nice design of the kitchen and eat in dining room! The house picture, hanging apron, and fruit bowl are homely touches there. The office nook is very nice for Sims to enjoy sitting at the desk table using the computer. The plants are nice touches of nature either sides of the desk. Very nice furnishing of each of the bedrooms! The wallpaper patterns, wall decor items, and colour schemes of the rooms looks very nice. Nice work, as always. Gave you a rec.